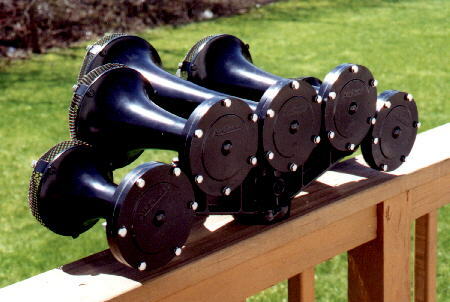 The newest style horn made by Airchime. People call the K5LA (K = Kettle Drum Principle, 5 = five chime, L = Low Mount, A = American Tuned) his masterpeice. The K horn was first created as what is now known as the K5H (Canadian version, "H" standing for "High mount bracket"), sounding E flat minor 6th, or D#, F#, A, C, D# octave. Mr. Swanson was asked to make the K5 sound more like the M5, but his first attempt failed when creating the 1L bell in place of the #4. Deane Ellsworth, who was incharge of horns at Amtrak, proposed the K5LA chord to Swanson. Mr. Swanson milled out the throat of the #3 and #4 to change their notes without having to make new patterns for new bells. This was a success, giving the K series horn a new, "upbeat," sound. Amtrak ordered this new horn, which came with a newly designed low mount bracket (before then, the high mount bracket was the only option). 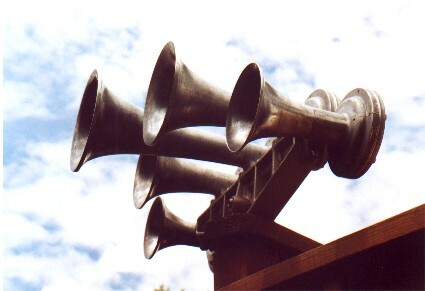 There is a "early version" of this horn. The difference is that the #5 bells of the first productions had large inner bell throat diameters, and the later version has smaller diameters. This is because AirChime had two casts for #5 bells and wanted to use only one (for cost reasons). The smaller diameter 5 bell, called a "5H", nicknamed "The African 5 bell" (because of its use in Africa) plays a higher pitch note, so they now have to bore out the inside of the 5H bell to lower its pitch to play the same note as a standard 5 bell. Many railroads use the K type of horn today such as CSX, BNSF, NS, and Amtrak. The K5LA plays D#, F#, G#, B, and D#octave. Most #3 and #4 bells on the K5LA are stamped "A", which stands for American tuned. K5LA's are the horn that Amtrak, CSX, NS, and other railroads use, and the three chime version, the K3LA is also a very popular horn found on a variety of locomotives today. Freight railroads often reverse some of the bells to give sound in both directions (since some units are used operating in reverse). When a K horn has bells reversed, it's name will then tell what bell(s) are reversed. Example: K5LA with the 2 and 4A bell reversed is called a K5LAR24 (the 4 bell is not called 4A as the "A" in the name K5LA states that this horn has a 3A and 4A bell). Snow cones are available from the factory for K horns, and can been seen on most commuter railroads (such as MBTA and MARC). Amtrak makes their own snow cones, which look very similar. Visit the Snow Cone Section. 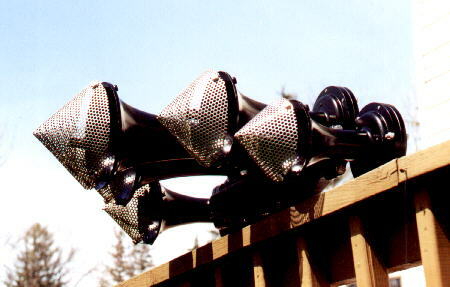 AirChime used to have adjustable back caps available for K horns. 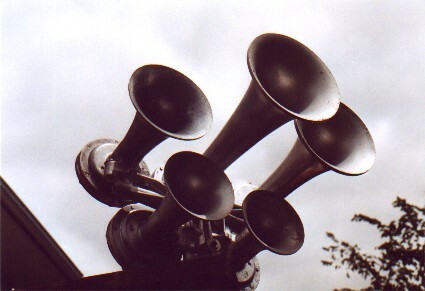 The MK5H was the name of the horn made with these adjustable backs, that allowed the horn to be blown at a range of 2PSI to 300PSI depending on how it was set. These horns were only made for one year, and then a newer style of adjustable back cap was made. Both versions of the adjustable back cap are very rare. 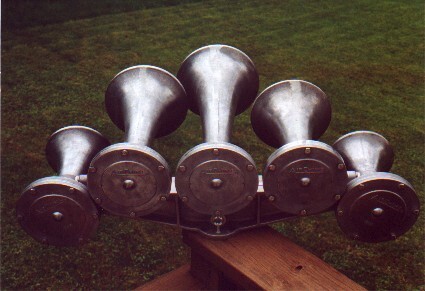 The K5LA uses bells 1, 2, 3A, 4A, and 5. The K Horn Photo Section. All recordings are for PERSONAL USE ONLY. Please ask if you would like to use them for another application. Do you like these recordings? If so e-mail me asking about my CD filled with 99 tracks of train horns! K5LA on Reading FP-7 No. 902, recorded in Modena, PA on the Wilmington & Northern branch of the Reading during a photo runby not long after their restoration. Recording by: John Ricciardi.